When I first came to BU, I was told one of the places I had to visit in Boston was the North End to check out Mike’s Pastry and Modern Pastry, bakeries famous for their cannoli. Most people told me Mike’s, located at 300 Hanover St., was their favorite, while others stood by Modern Pastry, which is at 257 Hanover St. I, of course, had to find out for myself. First stop was Modern Pastry, which is smaller than Mike’s, although they are soon moving to a larger location next door. Unlike Mike’s, Modern Pastry does not focus most of its attention on cannoli, but also has a large menu that even includes pizza. At Modern, cannoli make up a small part of the whole menu, but the deal is customization: you choose the shell, the filling, and any toppings. Each connolo is filled to order, instead of ahead of time. The choices are simple and classic. I waited in line fifteen minutes (it was a Saturday afternoon and everyone was getting dessert after lunch) and got two kinds of cannoli: one with a plain shell, a ricotta filling, and chocolate chips; the other with a chocolate dipped shell and ricotta filling. I chose to have them add powdered sugar on top. I paid $6 total, $3 apiece, and then made my way to Mike’s Pastry. Mike’s Pastry had the same wait time, although the line was much longer. Once inside, the line split off into several lines for increased efficiency. Mike’s also has more than just cannoli, even including gelato, but cannoli come across as the main focus. Lining the walls are photos of all of the varieties, including strawberry, hazelnut, peanut butter, limoncello, and my Mother's personal favorite, caramel pecan. In order to have a fair comparison, however, I bought one chocolate chip and one chocolate dipped– just as I did at Modern. At Mike’s, the cannoli are filled in advance and sit on trays in the refrigerated display cases. Again, I opted for powdered sugar. The cannoli here were slightly bigger, and more expensive: the chocolate chip was $3.50 and the chocolate dipped was $4. Armed with my two boxes of cannoli, I began the best part of my research. Modern’s cannolo had a nicer presentation than the ones from Mike’s, which I believe is largely because they are filled for each customer and do not have as much time to be bumped around. 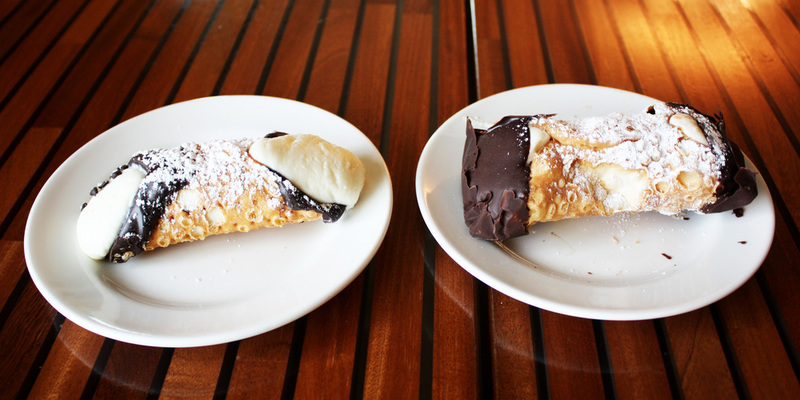 The chocolate dipped cannolo from Modern had only its shell dipped in chocolate, whereas the one from Mike’s had everything dipped, including the filling. Regardless, they all looked delicious. Now, the tasting. The shell from Mike’s Pastry was flaky and airy, just like a delicate pastry shell should be. Modern Pastry had a crunchier shell that was cookie-like. The cannolo with the chocolate-dipped shell was preferable to the cannolo that had been dipped entirely in chocolate, and I liked both of those better than the ones with chocolate chips. The chips were too crunchy and took away from the texture of the shell. Finally, it came down to the filling: Mike’s was richer and had more ricotta flavor, and Modern’s was lighter and sweeter. At the end of the day, this was not a difficult choice for me. Mike’s Pastry had the better cannoli, so the popular opinion rules. If you aren’t a big fan of traditional pastry filling and are looking for something a little sweeter and lighter, then perhaps you’ll like Modern’s better. Not only was the cannolo from Mike’s Pastry better, but the overall experience in the lively atmosphere there was more fun. Whichever bakery you choose, they are both cash only, so come prepared.